wxMusik is an MP3 and Ogg player and library that features advanced crossfading for smooth playback, 16-band dual-channel equalizer, powerful batch tagging, SQL database, advanced playback options, and static and dynamic playlist creation. I TRY and find a better gui and there simply isn't one (use a win theme like vista inspirat tao2005). 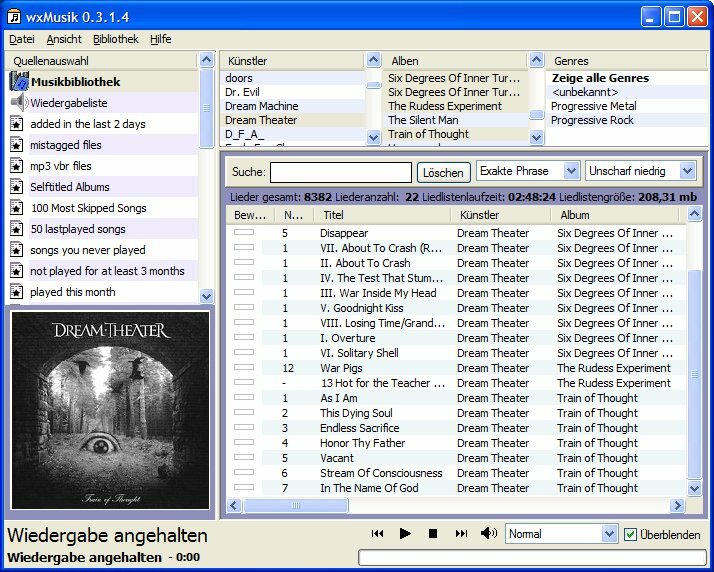 Until Amarok is fully ported this will be the music manager player of choice. XMPlay has the best url support and so when installing wx DO NOT let it put it's own url support in. Wx will not play 24bit flac nor does it have any plugs or skins of it's own. It is simply hands down the simplest, most powerful gui for playback of audio. Looks cool. Wouldn't see me downloading it. The UI looks trashy. Prolly has some major, or minor bugs in it. Big problem, is that it lacks alot of the features that I am use to in a media player. Great program.Keep up the great work.Foobar is nice but this is more comfy and may be easier for most moving from itunes etc. @fixed bug when moving and deleting songs in the now playing list. The currently playing index was not mantained correctly in all circumstances. @the currently playing song can now be deleted from the computer with right click menu. @fixed bug, which prohibited the creating of a mail in case of a crash. @fixed bug, when choosing "view dirty tags" from the menu, the library was shown instead, the dirty tags were only shown if the library was already selected. I really like this program as well but, I frequently switch between: 1) Foobar (for it's very low memory footprint to start PRIOR to loading music) and it's reliablity and 2) XMPlay because it is full featured. I've used pretty much every audio program out there and this is the program I use for playback of my albums. The interface is very clean and uncluttered. Everything is laid out almost perfectly. (There was just a small learning curve to set up the program the way I liked which just consisted of stepping through the "preferences.") I especially like that it can scan for changes in the music folder. I use Musicmatch to do everything else. I've used Foobar and frankly I don't understand why people like it so much. I also don't understand why someone thinks this deserves a low score. It is free and does exactly what it is intended to do. It shouldn't lose points for not having certain features. If you just want a simple audio player I can't recommend anything better. the equalizer still doesnt work on my machine. + (Linux) XF86Audio keys supported. This means you can use your multimedia keys for wxMusik on linux. - several bugs fixed, i cannot remember. + the playing control area can now be placed on top of the window instead of the bottom. + using taglib for tag reading on writing of ogg,flac,mpc,mp3/2 files. (for ape files the mac sdk code is still used). taglib is faster and supports unicode for tags (even id3v2 tags) easily. + moved from cvs to subversion as version control software. Very nice... free jukebox ..